New York City is home to many churchs, but there are few that match the scale, majesty and splendor of St. Patrick's Cathedral. 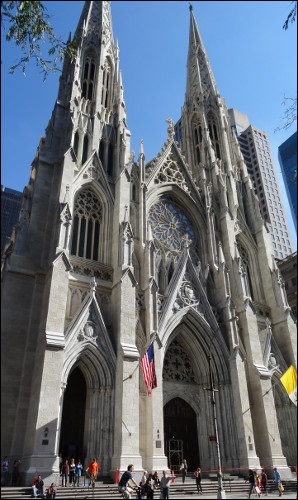 This land marked building is the center of the Roman Catholic Church's Archdiocese in New York City and since May 25, 1879, has been a grand place of worship for "America's" Parish. St. Patrick's Cathedral is open to the public even when there are no services in progress. All are welcome to simply tour the building, and of course you can light a prayer candle or attend mass. Tours - You can take a free guided tour of the cathedral at 10:00 am several days a week (see the St Patrick's Cathedral's website for dates). If you have a group of 10 or more, you can call in advance and arrange for a group tour. Art & Architecture - If you are a lover of art or architecture, there is no greater place to visit than St Pat's. The sheer height of its ceiling and the massive columns that support it are an amazing feat of architectural design. 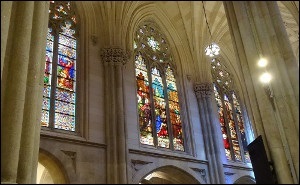 The stained glass windows are brilliantly colored and are a wonder to behold. It is truly an impressive structure well worth a visit. The east side of Fifth Avenue between 50th and 51st Streets across 5th Ave from Rockefeller Center. Of course it's FREE to visit St. Pat's. Preferably B, D, F, or Q to 47-50th Rockefeller Center Station (Sixth Avenue) and walk to 5th Avenue. The Bells - There are 19 bells located in the cathedral's north tower. No two are alike, and each is named after a saint. The largest weighs in at 6,608 lbs. Today the bells are controlled electronically and a keyboard is used to make their melodious sounds, but up until 1952, a bell ringer had to climb into the tower and make them sing. The Crypt - All the archbishops who have served New York to date have been laid to rest in the cathedral's crypt. The Organ - The organ has a total of 8600 pipes that are scattered throughout the cathedral and it can be played from two different locations.